I think we need to be grateful to Hamilton and McLaren for making a fight of the Turkish GP. This was supposed to be yet another Ferrari walkover and so it would have been, had not there been more guile to the McLaren effort than anyone expected. 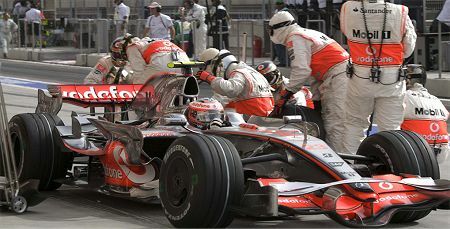 Heikki Kovalainen can suggest that he could have won, if only he had not picked up the slow puncture, but the fact is the Ferraris still had a considerable advantage on this track and it was only the skill of Hamilton and race strategy by McLaren that prevented another crushing whitewash by the red team. Much has been said about Hamilton's choice of tires and whether Bridgestone should or should not have catered for his known rough usage of them. I say that McLaren's strategy in the circumstances was perfect, that the three-stop plan was the only way for them to stay with the Ferraris and it had nothing to do with tires. Consider what would have happened had Hamilton been on a two-stop strategy (and ignore, for the moment, safety car periods - we are talking pre-race plans here). Lewis had to be light on fuel in practice to give himself the best start possible; that would have forced an early pit stop and a passport to a battle with the BMWs. Add to that a longer final stint on the option tire that the McLaren hated and Lewis might have lost even that battle. If Hamilton were to make a fight of it, he had to be on a three-stopper and all the talk after the race was just smokescreen. Baldiserri knows - hence his frustration at being outwitted by McLaren. As for Heikki, I think it is easy to talk after the event. He did a reasonable job of making his way back through the field but it is anyone's guess as to whether he would have been able to hang on to the Ferraris. Given his problems passing Piquet and Glock, plus a fastest lap a second slower than Hamilton's, I doubt it. Turning recent form around, Sebastian Vettel managed to finish this time while Bourdais found himself in the gravel. STR boss Tost admitted that it was a mechanical failure that caused the retirement and puts his faith in the forthcoming debut of their new car; but I wonder how long his dubious temper will allow him to accept the team's continuing poor reliability record. New cars tend to have more problems in that area than old, after all. Watch your backs, Seb and Seb! Finally, a word about the team that were conspicuous by their absence: Super Aguri. I feel the same sadness at their demise as most do but am coming round to Sidepocast's more realistic view of them. Honda have enough problems, as demonstrated so effectively by their lack of straight line speed in Turkey, without having to feed constant blood transfusions to a 'B' team that should never have been set up. We can quibble about Honda's pickiness over sponsors for SA but, given that they had already made a bad judgement in the selection of one that disappeared before the money arrived, their reluctance is understandable. It would have been kinder to have put an end to their misery over the winter, perhaps, and I suspect that Ross Brawn stands behind the final decision to turn off the life support systems. Overall, Turkey supplied the best race of the season so far, with plenty of action and close racing. Once again, it is shown that not all the blame for boring modern circuits should be loaded upon Herman Tilke's shoulders; given a flat piece of land and the FIA's restrictive circuit design guidelines, one has to wonder whether anyone could do better. I agree the three-stopper was workable but really Hamilton lost the race on Saturday. With four laps' less fuel in than Massa (assuming his first stop wasn't early) he needed to stick the car on pole to win the race. I don't think that was possible, Keith. The Ferrari had an advantage nearly as great as in Barcelona and the McLarens could only stay with it when running light. Okay, Lewis on his best qualifying form might have managed to pip them for pole, but in the race Massa would have sailed through at the pit stops and it would have been back to square one. I suspect that McLaren was mightily pleased to have stolen second, let alone the win. I think this shows another example of the FIA's wooly thinking. We have a McLaren on hard tyres racing a Ferrari on soft tyres for most of the race and then for no sensible reason a perfectly good race is decided by who does best on the tyres they don't want to run. I thought the idea of F1 was to optimise performance not throw the drivers a handicap and see who deals best with it. When the FIA decided to have one tyre supplier there was no mention of a two tyre rule. When Bridgestone won the contract there was no thought of a two tyre rule but as soon as Bridgestone realised they would get less publicity they dream up this stupid rule and we are saddled by it. Bridgestone should have been told where to get off and the bidding re-opened. We should either go back to multiple tyre suppliers so that the teams can develop their cars and tyres together or have Bridgestone take a range of tyres to a race and let the teams choose the tyres they want. Apart from anything else how often was the word Bridgestone mentioned over the weekend. In all the coverage I saw or read tyres were refered to either as hard/soft or prime/option. The word Bridgestone was barely mentioned. Contrast this with Moto GP coverage where a couple of laps into each race the commentators are told which tyres each rider has chosen and they always say something along the lines of 'Michelin have given us their tyre data'. We are stuck with a stupid rule because Bridgestone thought it would generate publicity which it patently does not. So let's bin it and give the drivers the tyres they want and we will get better racing. According to last week's Autosport Ari Vatenen wants the job. Now if anyone knows about what it takes to make cars look spectacular it is Ari. For younger readers (anyone under 30ish) Ari was the 1981 world rally champion and had a style like Colin McRae. The first time the two of them sat in the same rally car they managed all of 100 yards before Ari rolled it. I just thought Ari's co-driver was none other than Prodrive's David Richards. That could open up a whole can of worms. Ari has been a member of the european parliament for the past decade. He has a Finnish constituency despite living in France. What I would like to rate here is how ambicious seemed McLaren and Lewis with a three stop strategy, while the rest of the pack remained tied to the classical two stops for those who qualified in the top ten, and a single stop for the rest of the pack. In fact, I can't remember a three stops race by anyone throught this season. Alonso was near in Barcelona but it seems that he switched back before his engine died. I really don't know why the teams use computers to find the best strategy, killing what human mind can do best: innovate. How much I miss Schumi, when his 4 stops in Magny Cours comes to my mind, what piece of a lesson!! Absolutely, Architrion, allowing the strategy to be flexible can be the key to success. That was Brawn's genius, I think, being able to react quickly to the circumstances as they occurred, rather than stick to a hard and fast plan made the night before. And, in Turkey, I think the three-stopper was the only chance for a McLaren victory if a Ferrari got ahead at the start. From interviews alone, it shows Hamilton was happy to have gotten second. My first thought after qualifying was "They split the Ferraris" and that's an achievement. I am a little bit bothered that other teams, especially minnow teams, do not deliberately run light during certain stints, partly to put on publicity stunts like Toyota did in Suzuka not too many years ago, and partly because, who knows, it may push a driver into making a mistake that wrecks him out and earns you some points! Furthermore, there's actually a slight chance the strategy might work! I understand Steven's complaint about the tire rules- it is merely a copy of the rule the late ChampCar series used, and in other American series where the tires are dictated, the tires are simply identical for all teams and there is no option, aside from how much you want to stagger or inflate them. In these series, winning teams always say that the tires were dream choices and losing teams say the tires were terrible. I think choosing the tire you want from a range is a wise idea, as Bridgestone had poorly chosen the same tire for hot Spain and cool Turkey; maybe the teams or drivers should be given a choice. Knowing McLaren didn't have a choice, I'm surprised Kovalainen didn't go to the option on his post-slow-puncture stint just to get it out of the way, changing back to hards once some of the traffic laps out of the way. When an announcer drops the name "Firestone" by substituting it for the word "tire", take a drink. On any mention of Ethanol, take a drink. During any full course caution, chug until the pits open. You trying to get me drunk, Chunter? I can see that one coming a mile off! As for BMW in Turkey, I think they were where McLaren expected to be. The cooler conditions suited the McLarens, however, and gave them the chance of getting amongst the Ferraris. I don't think that this is an indication that BMW will drop behind the big two, however; it was more one of the usual slight alterations in the balance of power that occur from one track to another. Since there are Ferrari tracks and McLaren tracks, there are bound to be a few on the way that suit the BMW too. Lewis must thank Heikki for his second place. If Kimi had not damaged his front wing Lewis would have finished third no matter how many stops he made.